The “magic” behind a dental implant’s durability is the special affinity its imbedded titanium post has with bone. Over time bone grows and attaches to the titanium surface to produce a strong and secure hold. But there’s one important prerequisite for ultimate implant success—there must be an adequate amount of bone available initially to properly position the post during implantation. Otherwise, the implant may not have enough support to position it properly or cover the implant surface completely with bone. Inadequate bone can be a problem for patients who lost teeth some time before and now desire to an implant restoration. This happens because when teeth are missing, so are the forces they generate during chewing. These forces stimulate new bone growth around the tooth root to replace older, dissolved bone at a healthy rate. If that replacement rate is too slow, the volume and density of bone may gradually diminish. There is a way, though, to build up the bone for future implantation. Known as bone preservation procedure or a ridge augmentation, it’s a surgical procedure in which the dentist adds bone grafting material to the extraction socket or the bony ridge. 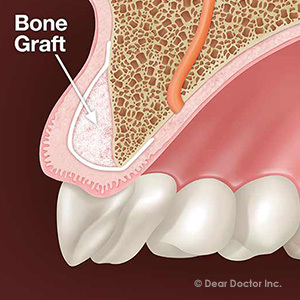 The graft serves as a scaffold for new bone cells to grow and multiply. If successful, there will be enough new bone volume after several months of healing to support proper implant placement. Bone grafting can add more time to the implant process. It may also mean you will not be able to undergo immediate crown placement after implantation (a “tooth in one day” procedure). Instead we would probably suture gum tissue over the implant to protect it and allow for full integration with the bone over a few more months. In the meantime, though, we could fit you with a temporary restoration like a removable partial denture (RPD) or a bonded bridge to improve the appearance of the space while the bone continues to heal. After several months, your implant will have a better chance of a secure hold and we can then attach a life-like crown. Even if you’ve suffered bone loss, you’ll then have the benefit of not only a durable implant but also a new smile.